Home | Should You Invest Your Emergency Fund or Not? Have you noticed interest rates are still pretty low? I mean, sure, rates are higher than they were a couple years ago, but you won’t get rich anytime soon by letting your money sit in a savings account. This all means that an emergency fund sitting in a savings account is pretty much doing just that – sitting there. An emergency fund is supposed to be easily accessible and “safe,” right? But what if you want your money to do more and the idea of investing your emergency fund seems intriguing. How crazy is that? Note: This isn’t an exercise in analyzing returns and risk and whatnot, but rather thoughts I’ve been mulling over and putting out into the blogosphere for feedback. It’s likely you already have an emergency fund of some sort. If not, then you should start one. Why? Life is unpredictable and things like car repairs, job losses or medical bills can crop up unexpectedly. Your emergency fund in there so you can pay for unexpected expenses, which means you need to be able to get to the money easily. This is why you’ve heard the advice of keeping your emergency fund in a savings account. It’s easily accessible and won’t lose value. But lately, I’ve been seeing more people state that letting money sit in savings is a waste. The argument is that the money in your emergency fund should be put to work by investing in the stock market. At first, it seemed that most of these voices were Millennials that hadn’t really experienced a recession where they lost savings. The oldest of Millennials were in their mid-20s (roughly) back in 2008. After a little more digging, I noticed a few Gen X (or older) voices saying the same thing. What?! When an emergency comes up, you’ll want easy access to your money. Do you have easy access with a savings account? Yes. Do you have easy access with an investment account? Likely yes, though there is usually a settlement period of about two days after the day you sell your investment to when the funds are available. Then there is the time to transfer, which could be same-day or a couple more days with an ACH transfer. With either a savings account or an investment account, your money is easily accessible. But you do have faster access to savings than investments. As far as accounts, you could invest your emergency fund in either a regular brokerage account or with your Roth IRA. Why the Roth? You can withdraw contributions (but not gains) at any time without penalty. Though for full disclosure, I dislike the thought of mixing designated retirement funds with anything else. Am I too financially cautious? Perhaps. 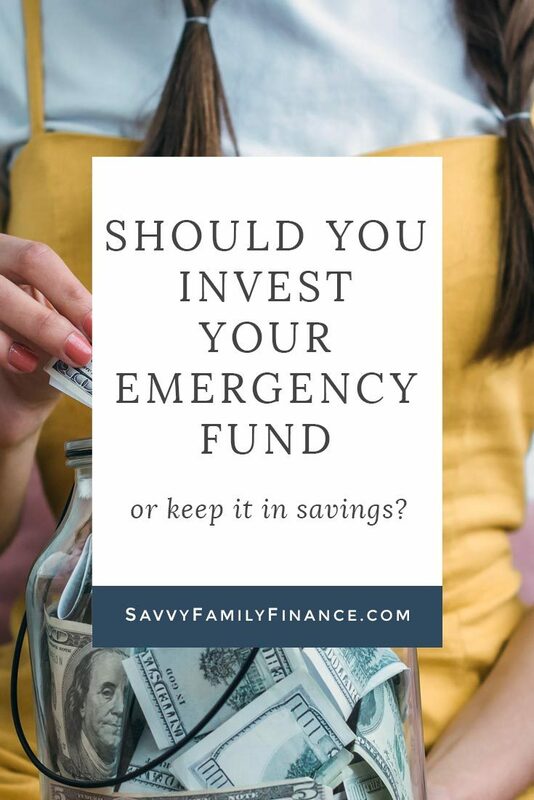 The main argument from those that are in favor of investing their emergency fund is you can get a far better return on your money. Your money is working for you. Right now, brick-and-mortar banks are offering about .01% interest on savings accounts. That’s pitiful. But, if you look at high-yield savings accounts at online banks and even some credit unions, you can find interest rates of 2.1% and higher fairly easily. Depending on the account and month, this is close to or above the current rate of inflation . Going back a couple of decades, interest rates on savings or CDs was higher than you find today (5% or more then), so your money was getting a decent return. While the interest rate on savings accounts has increased recently, it still isn’t anywhere near the levels of 20+ years ago. What’s a person to do? If you invest your emergency fund into a total market ETF such as VTI (not an endorsement), then most years you’ll have done very well. Other years there may be a loss such as in 2018 when VTI had a return of -5.31%. And back in 2008? It was down -36.97%. In fact, if you’d put money into VTI on Oct 9, 2007 (closed at $77.75), you wouldn’t see the price recover until late January 2013. As a Gen Xer, I also had the privilege of experiencing that loss before as well. If you look back, money invested in the market in August 2000 would take nearly 5 years to recover from that downturn. Given our history, it’s understandable why I’m a bit conservative with where we keep our emergency fund compared to those that have only really experienced a decade of good growth in the market and low-interest rates. So, what do you do? If you put your emergency fund in a savings account, you run the risk of inflation outpacing the interest rate on your account. If you invest your emergency fund, you run the risk of low or negative returns. I’m thinking back to 2008 (and 2000). If the economy tanks, there is a heightened chance of job layoffs. Is your emergency fund substantial enough to handle both negative returns and a job layoff? How easy would it be for you to find another job? Do you have enough savings (and risk tolerance) to withstand a drop in the stock market? If you are living paycheck-to-paycheck, I’d argue investing any amount of your emergency fund in the stock market isn’t a good choice. There are good reasons to keep your emergency fund in savings. You can get a reasonable interest rate with online savings accounts, you may not want to risk what you do have, and it’s easily accessible. But if you already have a full three or even six-month emergency fund saved up plus a cushion to withstand a market pullback, then you could make the argument for investing much of your emergency fund. Doing so can help your money grow and work for you. What do you do? Do you keep your emergency fund in savings or CDs, or do you invest it?